Rum production started in the 17th century at Caribbean sugarcane plantations and still, 80% of it is produced in the Caribbean. It is a distilled beverage that’s made from sugarcane (the same sugar cane that makes the sugar you have in your coffee) or its by-products – sweet! This is then fermented to turn it into alcohol – and depending on how many times & how the rum is fermented, it can be heavy or light. We like to use all kinds and play around with your taste buds. 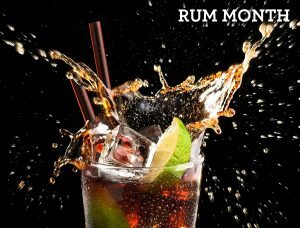 We love the fact that rum has been around for generations and become a part of history. 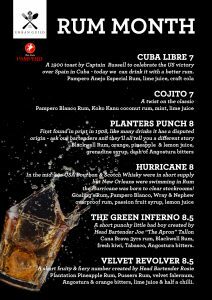 So, working with our friends Pampero, we will be serving some new, hooking rum cocktails this month to give you a taste of what it’s like to sail the seven seas (in style!) this August. You can see the Rum cocktail menu here, and we will also have the Rum Runner pizza available throughout August, inspired by the practice of rum running that originated during the American Civil War. Soldiers would sneak liquor into army camps by concealing pint bottles in their boots or trouser legs. 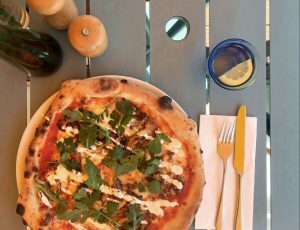 The pizza has a Napoli base with fior de latte, jerk chicken, sour cream, rum & honey syrup, coriander & rocket.